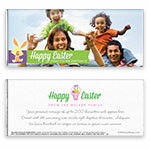 Celebrate the season in simple style with this fun, full-photo chocolate bar wrapper, playfully adorned with a sweet Easter bunny. Design: Large photo with colourful Easter bunny ribbon. Personalization: Front ribbon, and back title and message.